I have been making prescription cycling sunglasses for over 10 years now, technology has evolved but the best frame styles for cycling remain. The prescription lens technology is easy always make sure you get digitally remastered prescription lenses, also known as Freeform, meaning your prescription is recalibrate for the exact curve / frame you choose. These digital lenses are available in all forms, transitions, polarised, sports transitions (which have base tints) and clear for winter / night time use. I’ll keep it simple and show you the best 5 prescription cycling sunglasses. You will see a lot more available and if you’ve tried one on and loved the fit and style then go for it but if you simply don’t know what to go for then pick the frame you like the look of best out of these 5 and you’ll get a fantastic pair of cycling prescription sunglasses. I’ve been selling prescription cycling sunglasses for over 10 years now and these frames always get repeat sales from the same people that realise they can’t beat the sunglasses they have. Do you require the sunglasses to be wearable at night time and day time? 2. If you are just wearing during the day – Do you suffer more from bright light or low light (bad contrast)? If bright light – purchase a solid 85% tint or polarised lens. If selecting polarised, which are amazing for eliminating glare please note in certain conditions polarised will make ice invisible so i’d advise only purchase polarised for summer riding. If low light – purchase a rose / orange base lens which has around a 50-75% absorption rate. These will be amazing for mixed weather conditions and most manufacturers do lenses that fall into these tints. Example: Oakley Prizm, Bolle Rose, NXT Vario copper – dark copper. Probably the best selling cycling specific sunglasses. Incredibly adjustable, ideal for adjusting to fit perfect with your cycling helmet. Great directional air flow that maximises fog free, added even further with the adjustable nose pads which can be set to make the sunglasses stand further away from your face to further reduce fogging up. Who will these suit – The Rydon sunglass is made for the road and mountains, if you simply want a pair that functions best on your bike and will be wearing a set of Oakley’s or Ray Bans for driving / Holidays then these are perfect. Oakley has the name but can they perform? The simple answer is yes, Oakley have made it to the number 1 spot through reinvestment in technology and leading quality. The Flak Jacket XLJ prescription sunglasses for Cycling are perfect for serious cyclists who also want to double up their sunglasses wear for driving / holidays. With a stylish frame and cosmetically pleasing appearance the Oakley Flak Jacket XLJ are the perfect pair for cycling once up to several times a week plus general wear. These can be purchased with Oakley true Digital lenses for low to medium prescription (+2.00 to -4.00) and Oakley HDO EDGE lenses for high prescriptions (+2.00 to +4.00 and -3.50 to -6.00). The EDGE lenses tapper off the last temporal 10mm edge of the lenses to cosmetically leave a significantly thinner lens. If you fall outside these power ranges then check out our own Xtreme lenses that can go even higher, whilst still giving you digital enhanced vision with digital recalibration. 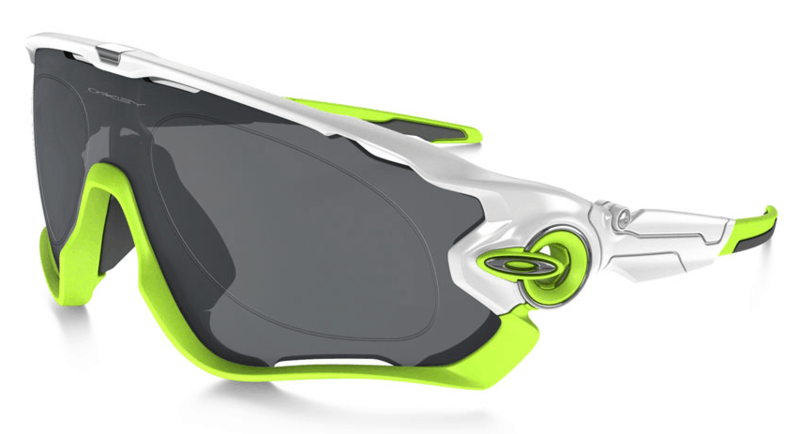 Oakley Prizm Road – for road cyclists, specific lens for cycling, for mixed weather. Oakley Prizm Trail – for mountain biking, slightly lighter version than the Prizm Road. This is the frame to go for if you have a high plus prescription, a classic cycling sunglasses with adjustable nose pads to create the perfect fit. Bolle prescription sunglasses for Cycling come with a new lens technology called B-thin, this technology uses the simple fact most wears don’t use the last temporal 1/3 of the lenses. They can then effectively make your lenses much thinner, whilst maintaining the appearance of the sunglasses. We find this technology works really well for plus prescription as the lenses come out looking amazingly thin. High Minus (-3.00 upwards) will also look better as the lens temporal edges will look significantly thinner. Best Lenses to check out – Bolle Modulator Rose, Rose base tint which reacts to a dark Grey. Ideal for low-medium and bright light whilst maintaining good contrast and depth perception in all light conditions. These are for the dedicated Cyclist who simply wants the widest and deepest lens available. The Oakley Jawbreaker uses a visor lens which gives the best protection from high speed winds and dust / dirt. Quick interchange lenses means you can also purchase additional prescription lenses for different light conditions. These are ideal for occasional cyclist. Coming in at a very reasonable price whilst still including the latest Digital prescription lenses. Uvex is a German made sunglass so even though the price comes in low the frame quality is very high.